They are said to have been created as a single soul but later divided into two and each was released to the world in different situations; financially, geographically, socially to enable them grow and mature independently. The two souls are supposed to live life on their terms and develop their characters while getting to learn essential life lessons after which they are meant to come together and unite once more into one. At this point they are able to live peacefully and with their different skills and abilities they are able to complement each other. So What is the Twin flame Sexual Attraction? 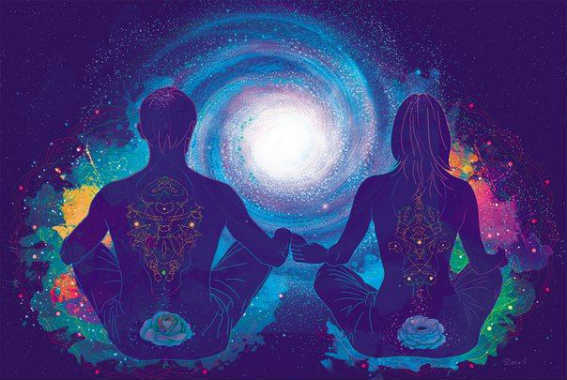 When the twin flame couple meets, their is an unexplained connection between them. Its quite a deep, affectionate and comfortable feeling that simply draws them towards each other and it can be described as irresistible. The feeling is quite natural and there is no pressure on the two to be together, they just experience a mutual feeling to be together and this is attributed to the fact that they once were one soul. Its believed that since they were one at a point in time, some magnetic attraction between them exists and when they make contact later in life the magnetic attraction takes effect and the two will simply want to be one again (Known as twin flame sexual attraction). Distance may not be able to take away this feeling as its not only physical but emotional and spiritual therefore their might be a natural mental connection that may draw them together. In addition, they will always be in each others minds and thoughts after meeting. The twin flames might have met different people before meeting and had intimate relations but they might have experienced various feelings indicating that something wasn’t right and definitely there was someone else out there for them. On meeting, the twin flames are believed to experience a soothing sensation of consent that everything has finally fallen into place and they have met their better halves. The feeling is beyond them and can’t be forced as its quite natural and everything just seems right. No matter the challenges and obstacles faced, the two are willing to fight them and overcome them just to be together and never be separated again. Despite life circumstances and barriers such as distance, language barrier, different social backgrounds and lifestyles, the universe still aligns itself to bring the two together and these barriers aren’t a hindrance to their unity. 01. One might have learnt a certain language in their childhood not knowing that this new language would later assist him/her in overcoming language barriers that would have come in between their unity. 02. One might also relocate to a different geographical location or even both of them can relocate to the same area just to enable them bridge the distance that hindered them from meeting. 03. One might also happen to meet friends or co-workers of different social backgrounds and lifestyle and this would later help the two in meeting. After their first meeting, the two will seem to develop irresistible feelings towards each other and start feeling as if the other is with them physically. In turn, special experiences such as feeling their touch, kiss and even smell start to occur. They might start having dreams about the other in quite romantic and intimate situations and may end up day dreaming about each other and this would definitely draw them more and more together. The two are obviously destined for each other and their reconnecting can be attributed to the number 11 effect. The number might recurrently occur in their individual lives or even in their birth dates; separately or when totaled. The number is associated with life challenges, difficulties and experiences and this shows that the two souls have experienced some life challenges and overcome them so as to develop necessary skills and life lessons that would enable them complement each other. Their different challenges have definitely prepared them for each other and the feeling to finally meet the right one after their many failed attempts draws them together and when they meet they would never want to let each other go. Twin flame sexual attraction is quite different, rather than be all physical its rather the complete merger of body and soul.